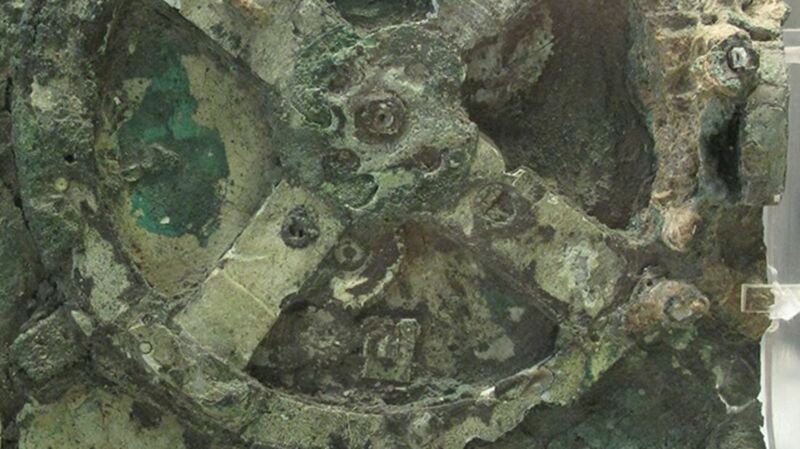 This week, researchers from the Antikythera Mechanism Research Project announced new insights about the mysterious Antikythera mechanism, an unusual artifact that has intrigued archaeologists, classicists, historians, and the public for decades. Here are 15 facts about the mechanism, sometimes called “the world’s first computer.” Jump right to #12, #13, and #14 for the latest interpretations of this singular object. 1. IT WAS FOUND IN A ROMAN-ERA SHIPWRECK AND NAMED AFTER A GREEK ISLAND. Located in the Aegean Sea between mainland Greece and Crete, Antikythera is an island that literally means “opposite of Kythera,” another, much larger island. The ship is assumed to be Roman and, when it sank just off the coast of the island in the middle of the 1st century BCE, carried a huge number of artifacts dating back to as early as the 4th century BCE. 2. THE FIRST EXPLORATION OF THE WRECK KILLED ONE DIVER AND PARALYZED TWO OTHERS. 3. THREE IMPORTANT ROMANS MAY HAVE BEEN INVOLVED. An astrophysicist at Athens University, Xenophon Moussas, theorized in 2006 that the boat on which the mechanism was found may have been headed to Rome as part of a triumphal parade for the emperor Julius Caesar in the 1st century BCE. A related theory is that the ship was carrying booty from the Roman general Sulla’s sack of Athens in 87–86 BCE. In the same time period, the famous Roman orator Marcus Tullius Cicero mentioned a mechanical planetarium called a “sphere of Archimedes” that demonstrated how the Sun, Moon, and planets moved with respect to the Earth. More recent research, though, suggests that the ship may have been en route to Rome from Turkey. The ship’s path has been difficult to trace because the Aegean was an important and busy shipping area at this time. 4. THE MECHANISM'S IMPORTANCE WASN'T RECOGNIZED FOR 75 YEARS. The unique bronze-and-wood object was found with a shipload of marble, coins, glassware, and pottery in 1900. Since all the other artifacts were more apparently worthy of conservation, the mechanism was ignored until 1951. After an additional two decades of study, the first publication on the Antikythera mechanism was made in 1974 by physicist and historian Derek de Solla Price. But Price’s work was unfinished when he died in 1983, without having figured out how the device actually worked. 5. JACQUES COUSTEAU AND RICHARD FEYNMAN WERE BOTH FASCINATED BY IT. 6. IT'S BEEN CALLED THE WORLD'S FIRST COMPUTER. Since long before the invention of the digital computer you are undoubtedly reading this on, there have been analog computers. These types of computers range from mechanical aids like a slide rule to a device that can predict the tides. The Antikythera mechanism, which was designed to calculate dates and predict astronomical phenomena, has therefore been called the earliest analog computer. 7. THE INVENTOR OF TRIGONOMETRY MAY HAVE ALSO CREATED THE MECHANISM. Hipparchus is primarily known as an ancient astronomer; he was born in what is now Turkey around 190 BCE and worked and taught primarily on the island of Rhodes. His works survive almost entirely through later Greek and Roman authors. Hipparchus was one of the first thinkers to speculate that the Earth revolved around the Sun, but he could never prove it. Hipparchus created the first trigonometric table in his attempts to solve problems related to spheres, and is therefore known as the father of trigonometry. Because of these other discoveries—and because Cicero mentions a planetary device that was constructed by Posidonius, who took over Hipparchus’s school on Rhodes after his death—the Antikythera mechanism is often attributed to Hipparchus. New research, though, has shown handwriting of two different people on the mechanism, suggesting it was likely created in a workshop or family business. 8. IT WAS SO TECHNOLOGICALLY ADVANCED, NOTHING SURPASSED IT FOR CLOSE TO 1500 YEARS. Consisting of at least 30 bronze gears in a wooden container that was only the size of a shoebox, the clockwork mechanism was highly advanced for its time. By turning a hand-crank, the user could move forward or backward in time. The crank made the gears move and rotate a series of dials and rings on which there are inscriptions and annotations of Greek zodiac signs and Egyptian calendar days. It seems that the information to build such a mechanism was lost through time, perhaps because it was a specialty device or expensive to create. Similar astronomical clocks didn’t reappear in Europe until the 14th century. Since inventions like this do not usually come from nothing, though, many researchers think that we may yet find older precursors in an archaeological context some day. 9. IT WAS DESIGNED TO MONITOR CELESTIAL EVENTS, SEASONS, AND FESTIVALS. The mechanism tracked the lunar calendar, predicted eclipses, and charted the position and phase of the Moon. It also tracked the seasons and ancient festivals like the Olympics. The calendar is based on the time from one full moon to the next, and a special dial allowed the user to also envision the seasons, which would have been useful for agriculture. Since the ancient Babylonians figured out the cycle of eclipses, the inventor of the Antikythera mechanism included two dials that rotate to show both lunar and solar eclipses. But the most sophisticated thing the mechanism did was lunar calculations—it could figure out the Moon’s period at a given time and model its elliptical orbit. 10. IT HAS A BUILT-IN INSTRUCTION MANUAL. Writing on a bronze panel at the back of the mechanism suggests the inventor left either instructions for how to work it or an explanation of what the user was seeing. The inscription, which is in Koine Greek (the most common form of the ancient language), mentions the cycles, dials, and some of the functions of the mechanism. While the text doesn’t specifically tell someone how to use it, and assumes some amount of prior knowledge of astronomy, it provides written-out labels for the person looking at the mechanism. While many of its functions have been figured out, how and where it was used are still unknown. Scholars think that it could have been employed in a temple or school, but could just as easily have been a fancy curio for a rich family. Without any other comparable artifacts or explanatory inscriptions, we don’t yet know who would have used this object or to what end. 12. …BUT THEY'RE CLOSING IN ON WHERE IT WAS MADE. The use of Koine in the numerous inscriptions places the creation of the mechanism in the Greek world, which was geographically large at the time. The festival dial mentions the Olympics in central Greece, the Naa in northwest Greece, and the Halieia on the island of Rhodes. The latest analysis of the inscriptions, reported this week by classicist Alexander Jones and colleagues, suggests the mechanism could keep track of at least 42 different calendar events. With those dates in mind, Jones and colleagues calculate that the creator of the mechanism was likely based at 35°N latitude. Coupled with Cicero’s mention of a similar device at Posidonius’s school, this means that the island of Rhodes is again the leading contender for the origin of the mechanism. 13. THE DEVICE ALSO TOLD FORTUNES. Jones and colleagues’ new interpretation of the mechanism is based on the extant 3400 Greek characters on the device, although thousands more characters are likely missing due to the incomplete nature of the artifact. Most notably, in their thorough linguistic analysis, these scholars discovered that the mechanism refers to eclipses’ color, size, and associated winds. The Greeks believed that characteristics of an eclipse were related to good and bad omens. Because of this belief, by building in predictive eclipse technology, the creator of the mechanism was letting the user divine the future. 14. PLANETARY MOTION IN THE MECHANISM WAS ACCURATE TO WITHIN ONE DEGREE IN 500 YEARS. The mechanism includes hands or pointers for Mercury, Venus, Mars, Jupiter, and Saturn, all of which are easily visible in the sky, as well as a rotating ball that showed the phases of the Moon. The parts that work these planetary pointers are gone, but text on the front plate of the mechanism confirms, according to Jones and his team, that the planetary motion was modeled mathematically using numerous complex gears—and that it was highly accurate. 15. THERE MAY ACTUALLY BE TWO ANTIKYTHERA SHIPWRECKS. Since Cousteau explored in the mid-1970s, little work has been done at the underwater archaeological site because of the remote location and the depth of the water. In 2012, marine archaeologists from the Woods Hole Oceanographic Institute and the Hellenic Ephorate of Underwater Antiquities again dove the wreck with the latest, high-tech scuba gear. They found a massive spread of amphorae and other artifacts. This means that either the Roman ship was vastly larger than previously thought or there is a separate wreck down there. Excavations have been ongoing for several years, with new artifacts brought up constantly. Summer 2016 is poised to reveal even more about the Antikythera shipwreck. You can follow along in real time via the Woods Hole website and blog.